Since the early 19th century the best, brightest and richest of London have set their foot in Les Ambassadeurs Casino to try and outwit the house in a series of games. This exclusive members' only club stands proudly at number 5 Hamilton Place, a location that holds eons of history and heritage. The current owners have had their hands on the club for just over seven years, buying it back in 2006. With the move it seems as though the club took yet another step on the socialite ladder and established itself as not just a top London location - but one of the finest gambling establishments in the world. 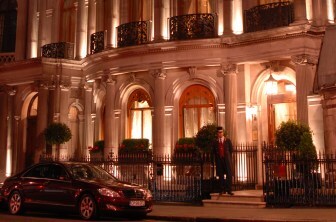 So if you feel like you want to gamble with the rich and famous, walk in the footsteps of royalty or play with diplomats - Les Ambassadeurs Club in London is the place for you to go. Thankfully the new ownership has dropped the bar a bit for joining the club and you can now gain an instant seven-day membership to anyone wanting to try the venue. If you then manage to meet the requirements of the General Committee then you can get an extended membership status - allowing you to come and go as you please. Les Ambassedeurs, or Les A as they refer to themselves at times, is a modern club that offers a wide selection of games for any type of gambler. They have managed to keep a classic feel to the whole establishment whilst still adding on some of the most modern and popular games on the casino scene. If you are a smoker you might not want to take a break from gambling when the urges call you. At Les A there is a very popular Garden Gaming Area where you can combine your smoking and drinking with your favourite games. There is a wide selection of modern slot machines and standard table games to keep you occupied for quite some time. This is also a heated area - allowing you to stay warm even during the colder months of the year - something we know London has a lot of. If you are after a top-class dining experience - whether you gamble or not - the restaurant at Les A is the place to be. The decor oozes style and class whilst the menu offers a contemporary approach to some classic dishes. You will be able to find almost any type of high-end food that you want and combining the restaurant with the casino makes for an excellent evening. The restaurant opens its doors to gamblers at 12:30 pm and runs all the way through to 2:30 am during weekdays. Opening hours during the weekend are limited to 7:30 pm to 2:30 am. One thing well worth noting is that the restaurant is open to the general public during lunch hours so it will be quite packed during the day. However, once the darkness engulfs London and the UK this will be an exclusive restaurant for gamblers alone. A great gambling experience is always topped off with a nice drink and the bar at Les A can offer you almost anything you can think of. There is a wide range of cocktails, spirits, beers, champagne and wine available along with soft drinks. The Red Room is a separate part of the bar and during major sporting events it becomes a genuine sports bar. You can watch your favourite team or player throw down on the national or international stage when you take a break from gambling. The Les Ambassadeurs Club hosts special poker tournaments on occasion but overall they have an apparent lack of events, tournaments and promotions. If you visit their website there is a small section called "What's On" which shows you the latest news. However, there is very rarely something on other than your standard gambling which draws down the overall impression of this club. In their defense it is worth noting that as a members only club most gamblers come there to do just that - gamble. This is almost the be-all-end-all of gambling in London and the UK. Les A is a place where you can combine high-stakes gambling and enjoy an excellent meal. The ideal location in some of the most fashionable parts of the city makes it easy to reach via public transport and car. But there is a price that comes with playing at Les A - that price is essentially money. You might be able to get your initial seven-day membership without any fuss but if you are after an extended membership you will need to put down some cash on the table regularly. However, once you are in the club it will take a lot for you to leave so it might be seen as a good initial investment for a bit of exclusivity. If it just seems like too much bother to register, put on your best outfit and go down to the club then why not play online at Les A? You can play at home in a casino made to resemble the land based offering and even play live games! And with a welcome bonus where they will match 100% of your first depost (up to £500), then you can't complain about the value. Find out more with our detailed review.